(Story updated at 4 p.m. 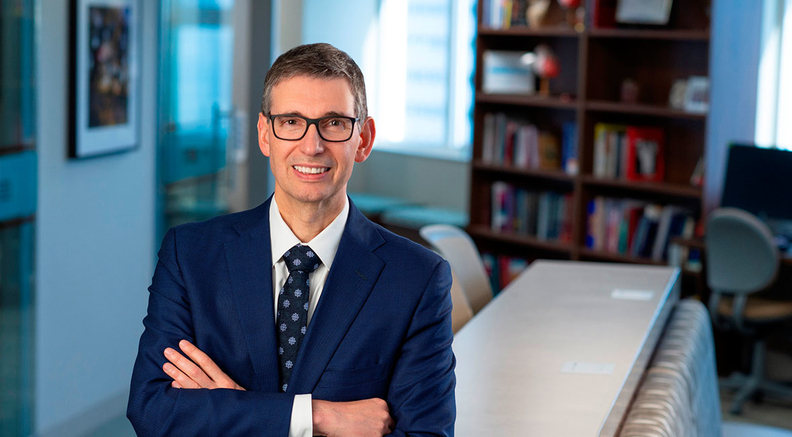 ET) Mayo Clinic has chosen top Florida executive, gastroenterologist and genomics researcher Dr. Gianrico Farrugia to be its next CEO. Farrugia is currently the CEO of the Mayo Clinic in Florida and a Mayo vice president. He'll succeed Dr. John Noseworthy, a neurologist who is retiring at the end of the year after serving at the helm of the world-renowned, Rochester, Minn.-based not-for-profit health system since 2009. Noseworthy, who will work closely with Farrugia until he takes over Jan. 1, called him an extraordinary listener, creative thinker and excellent physician. When Farrugia speaks to a group, he leaves people inspired, Noseworthy said. "That comes not so much by his style, but by his interest in the people with whom he's working," he said. "So when you're with him, he focuses on you, and that's a real gift that he has, and that brings people along." Chief among Farrugia's responsibilities will be overseeing the Destination Medical Center, a 20-year, $5.6 billion project first proposed by Mayo in 2010. The state of Minnesota has committed $585 million to the project, which was envisioned as an anchor for the growing Rochester population. The DMC aims to create more than 30,000 new jobs and generate $270 million in tax revenue for the city over the next 20 years. In Farrugia's current role, which he's held since January 2015, he leads more than 6,400 staff members. He's behind a $350 million effort to turn Mayo's Florida campus into its own destination medical center, including the opening this month of a building dedicated to treating complex cancers and neurological conditions. IBM Watson Health named Mayo's Jacksonville campus one of the country's top 100 teaching hospitals this year. Farrugia represented Mayo at the World Economic Forum in Davos, Switzerland, earlier this year, a spot Noseworthy had occupied at each of the previous six annual conferences. Mayo spokeswoman Duska Anastasijevic said that was merely the result of a scheduling conflict, but she noted that Farrugia has led Mayo's international strategy, given the health system is working to make its Florida campus a destination for international patients. Last year, less than 1% of Mayo's patients in Florida were from outside the U.S., according to operating statistics filed by the health system. The percentage was unchanged from 2015. Farrugia said his team doesn't focus on the percentage of international patients, but noted the campus has seen "remarkable growth" in patients from places like Central and South America, for example, who receive care that impacts their lives and Jacksonville's economy. Mayo drew about 12% of its medical services revenue from its Florida campus in the first quarter of 2018, according to operating statistics filed by the health system. Most of Mayo's services revenue comes from the Midwest. Prior to leading Mayo's Florida operations, Farrugia was director of Mayo's Center for Individualized Medicine, which is tasked with bringing genomics into routine clinical care. He also co-founded Mayo's Center for Innovation. "We realized how much more innovation was needed in this space," he said. Farrugia applauded Noseworthy's decision to allow individualized medicine and other Mayo sectors to span both its practice and research umbrellas, which he said has allowed genomics research to influence patient care faster than it otherwise would have. For example, when Mayo researchers sequenced the genomes of 1,000 Rochester patients, they found 98% had at least one gene variant that changed the way they metabolized drugs. A child with such a variant could overdose on a single dose of codeine, for example. Now, Mayo's electronic health records have alerts that instruct providers to test patients' genomes for certain drug responses. Mayo has avoided at least 14,000 adverse drug interactions since implementing the EHR alert seven years ago, Farrugia said. Farrugia has been a Mayo physician for 30 years. The system's bylaws require new leadership to come from within and for that leader to be a physician. He holds posts in gastroenterology, hepatology, internal medicine, physiology and biomedical engineering. He's a professor of medicine and physiology and a faculty member in biomedical engineering at Mayo's Graduate School of Biomedical Sciences. He earned his undergraduate degree at St. Aloysius College and his medical degree from the University of Malta Medical School, both located in his native Malta. He is the first foreign-born Mayo leader since Dr. William Worrall Mayo, the father of the Mayo brothers who hailed from England. Farrugia, a member of Mayo's board of trustees and its board of governors, co-authored a book highlighting the need for change in healthcare delivery. He has published more than 250 articles on genomics and the treatment of gastrointestinal motility disorders, according to a Mayo news release. "Dr. Farrugia brings an impressive depth of experience to this role," Samuel Di Piazza, chair of Mayo's board of trustees, said in a statement. "A prolific investigator and inventor, and an accomplished executive, he has been at the leading edge of innovation across the breadth of Mayo's clinical and research mission." Noseworthy has said he believes the trend of consolidation within the healthcare industry isn't good for patients. Farrugia agrees with that philosophy and said that the best healthcare model shares best practices and knowledge. He cited the Mayo Clinic Care Network established under Noseworthy; the network allows providers from more than 40 healthcare organizations in the U.S., China, Mexico and the Philippines to collaborate and help solve complex medical problems. "There are some acquisitions that would make sense," he said, "but we would rather focus on partnerships." Mayo said Farrugia's selection concludes a thorough search process led by a committee that included members of its board of governors and board of trustees; the 31-member group of external business and thought leaders and Mayo physicians and administrators unanimously voted to name Farrugia CEO. The committee gathered input from senior leaders, physicians and voting staff. Anastasijevic could not immediately share what Farrugia's salary will be as CEO. Noseworthy made $2.8 million in total compensation in 2016, including $2.2 million in base pay. Mayo's hometown newspaper, the Rochester Post-Bulletin, correctly named Farrugia as one of three likely contenders for the top post in March. Noseworthy announced he was leaving in February. During his tenure, he oversaw implementation of a new EHR system at the health system's main campus that was part of a $1.5 billion Epic installation. The renowned research institution finished the year with $707 million in income from operations on revenue of $12 billion, up from a $475 million income from operations last year on revenue of $11 billion in 2016, according to Modern Healthcare's financial database. Mayo invested $714 million in capital projects including implementation of a single, integrated EHR and revenue cycle management system. Those capital investments include expansions at Mayo Clinic's Florida campus, its Rochester, Minn., facilities as well as bolstering its cancer center at Franciscan Healthcare in La Crosse, Wis. The organization faced criticism last year after a speech from Noseworthy surfaced suggesting prioritizing the commercially insured over Medicaid or Medicare beneficiaries. Mayo also endured backlash for cutting services at its Albert Lea, Minn., hospital. Noseworthy said Farrugia shares his focus on the patient, although he's older and more conservative. Noseworthy will be 67 when he retires and Farrugia will be 55 when he takes over. One way that's apparent is in Noseworthy's plain, dark socks and Farrugia's "electric blue" Mayo Clinic socks. "That probably says it all," Noseworthy said, adding, "he's fun."